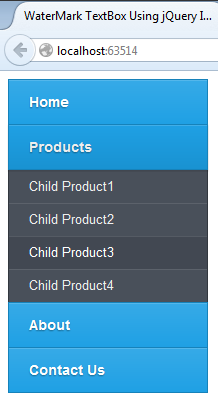 This article will show you how you can create a dynamic vertical css menu using jQuery, Css and C#.net In Asp.net MVC. 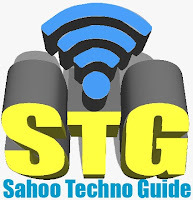 Some of my previous articles are as follows: jQuery Message Open As Modal Dialog Box In Asp.Net Without Refresh With Ok Button, jQuery Datepicker Calendar With Multiple Months in Asp.net, Autocomplete Textbox Using jQuery In Asp.Net and C#.Net, jQuery Datepicker Calendar With Restrict Date Range in Asp.net, jQuery Dialog Box Open On Button Click In Asp.Net, Responsive Grid Design Example Using Css in Asp.Net MVC,HTML, Stylish RadioButton, DropdownList, ListBox and TextBox Control In Asp.Net Using Css. So for this article first we will create a new asp.net MVC application and add a model class file and add the below code into it. In above code I have created a model class file with parent and child menu item. Now add controller class file and add the below code into your controller class file. In above code I have created two function in which I have added a static data. you just replace this with your DB data by mankind your menu item collection. Now create a view and add the below code into your view. In above code I have added the lop of parent and then on the bases of parent I have filtered the child item, and bind it to the li and ul. now click on product menu item. Thanks for this wonderful and helpful article. call repective pages from menulink in RenderBody. 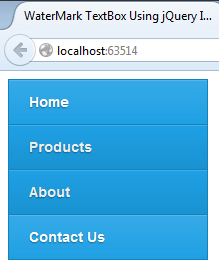 I have tried to call the Index action using jquery post and fill the menu inside the layout page. For the first instance t works fine but after that it gives error. hello! how can we create a third level in your example? Design you model as per the menu level and apply look for it.